American University awards its Wonk of the Year to an individual who is smart, passionate, focused, and engaged, and uses those attributes to enact meaningful change. On Thursday night, for 2019 WOTY John Kasich, the operative word was engaged. Kasich mostly dispensed with the lectern and walked around the stage, trying to connect with students in every corner of the Bender Arena bleachers. At one point, he even called on a couple students in the crowd. The former Ohio governor, congressman, and Republican presidential candidate delivered his speech with conviction and empathy. The enthusiasm continued during a candid moderated discussion with AU president Sylvia Burwell. 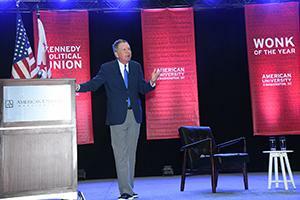 The student-run Kennedy Political Union hosted Kasich, with AU College Republicans cosponsoring the event. Kasich talked about growing up in a small, blue-collar town outside of Pittsburgh, Pennsylvania, the son of a mailman and the grandson of a coal miner. He then attended the much bigger Ohio State University. After meeting the OSU president and learning that he knew President Richard Nixon, Kasich had the audacity to write a letter to Nixon himself. Kasich was invited to a meeting with Nixon, which his family assumed wasn’t real and possibly a scam. But Kasich—a first semester freshman—soon found himself outside Nixon’s Oval Office. He met with Nixon for 20 minutes, which was longer than he got in the Oval Office during his entire time in Congress. “Why does that story matter? Have big dreams,” he said. While discussing civil rights and political leaders, he also highlighted a few everyday heroes who are changing the world. He spoke of a shoe shiner at a children’s hospital in Pittsburgh, who used his tip money to donate more than $200,000 for families who couldn’t pay their hospital bills. He talked about a nine-year-old boy in Ohio who grew up in a homeless shelter. After his grandmother adopted him and wanted to buy him an Xbox, he implored her to instead use that money to buy blankets for other homeless people. Kasich also exalted kindness from celebrities, including Drake visiting a sick girl in a hospital. Kasich returned to the idea of escaping your silo and listening to different viewpoints. “There’s nothing more boring than somebody who can’t listen. There’s nothing more boring than people who can’t explore something they don’t agree with,” he said. He then referred to an earlier conversation he’d had with Fanta Aw, vice president of campus life and inclusive excellence, about issues in Central Asia and Africa. “She’s interesting! She’s not boring! I don’t know if she’s a Republican or a Democrat. I have no clue. I don’t care. It doesn’t matter to me. She’s just something special,” he said. He praised President Burwell, recalling how they worked together on Affordable Care Act-related issues when he was a Republican governor and she was Health and Human Services secretary in a Democratic administration. During the question-and-answer session, a student asked Kasich what he learned from his presidential bid. “You want to be a successful politician? Let people know you care about them. Listen to them,” he said. Burwell ended the evening with a question about Kasich’s future presidential aspirations. “Is there anything that you would like to announce, or say, tonight, to close us out?” Burwell asked.